Before purchasing, please MEASURE FIRST the thickness of your door. Works on most doors up to 1 3/8" thick, including French doors and double doors. Does NOT work on bifold doors, pocket doors, or sliding glass doors. Requires handyman skills to install. Requires only one screw (included). This screw must be drilled into your door frame. GlideLok has holes for the possible attachment of a hook or rod (NOT INCLUDED), which is helpful for especially tall doors / shorter adults. Effective baby proofing, child proofing door latch. 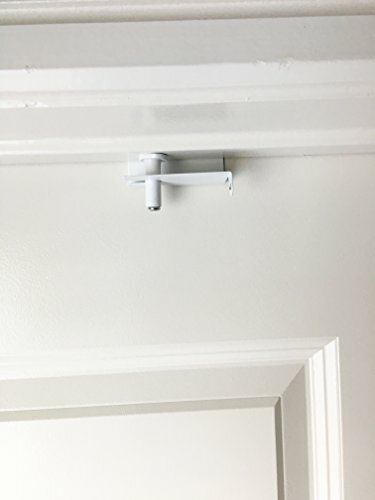 Rests on top of the door so kids can't reach it. Adults can conveniently operate the door from either side. Durable metal won't crack like plastic models. This child safety door lock keeps kids from opening doors to unsafe areas in your home, such as a closet, pantry, bedroom or bathroom. Works better than child proof door knobs or door handle safety covers.